Not having enough to eat, or a fixed home, and not being able to afford essential items like clothes and toiletries – destitution is the reality faced by many asylum seekers and refugees across the European Union (EU). Not only can this situation be terribly distressing, but it can also lead to worsening physical health in the longer term. People can find themselves penniless and desperate at any stage of the migratory process to and through Europe. Destitution also often impacts those that have entered the asylum system – from asylum seekers, to people granted protection after a process of interviewing and assessing an applicant’s evidence. National Red Cross Societies in the EU engage in advocacy with their governments to address the risks faced by destitute asylum seekers and refugees, and to respond to their specific needs and vulnerabilities. For example, in 2016 the Swedish Red Cross published a report on the “Consequences of the Amendment to Sweden’s Reception of Asylum Seekers and Others Act (LMA)”. It highlights that adults who have no children with them and who have had their asylum applications rejected, have seen their entitlement to accommodation, subsistence allowance and special aid removed. By limiting access to assistance, asylum reforms can trigger more destitution. Given the extreme vulnerability of destitute asylum seekers and refugees, many European Red Cross Societies deliver humanitarian assistance to reduce their suffering and provide for their most pressing needs. Services range from arranging emergency accommodation and distributing food and clothing, to facilitating legal and medical attention and supporting social integration. 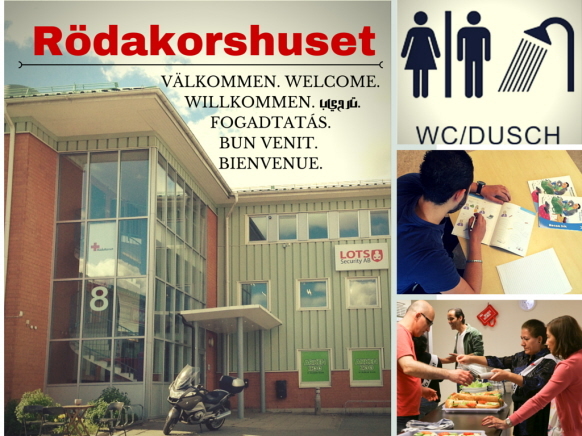 The Red Cross House “Rödakorshuset” in Skärholmen, a suburb of Stockholm, offers practical and emotional support to recent arrivals. Assistance includes hot meals and hot showers, in addition to clothing and washing facilities. There is space for painting and sewing, and emphasis is placed on learning the Swedish language and culture through formal classes, songs and social events. Approximately 80 people are welcomed there each day. Volunteers are the backbone of the Red Cross’ support for asylum seekers and refugees. In Skärholmen, there is a curtain where the name badges of volunteers are pinned up; it is a heartening reflection of how Swedish people have responded to the volume of asylum applications, that there are too many badges to easily count. People who have been through the system themselves also frequently sign up to help. Similar challenges and Red Cross services exist in the UK, where the British Red Cross is the largest provider of support to refugees and asylum seekers. Through its destitution services in around 50 towns and cities, the British Red Cross provided assistance to 14,909 people who had been left destitute in the UK’s asylum and refugee system in 2016 – a 10 per cent increase from the previous year. Asylum seekers do not have permission to work or claim state benefits in the UK. Nearly half of the destitution cases witnessed by the British Red Cross in 2016 concerned people relying on asylum support of approximately EUR 41.00 per week. Asylum seekers most commonly become destitute when there are problems with the imbursements, or when the payments stop upon rejection of their asylum claim. New refugees are particularly vulnerable, as governmental asylum support is withdrawn 28 days after protection status is granted. However, research shows that the process of finding work and somewhere to live takes much longer than 28 days. Due to the time it takes to get set up on the system, many are becoming destitute through no fault of their own. Of the destitute people given support by the British Red Cross last year, 21 per cent were new refugees suffering from this problem. Services such as these in Sweden and the UK emphasise how the Red Cross works to help people based on need alone, and not on the basis of their administrative or legal status. The latter is subject to change. The former is unchallengeable and must always take precedence.